Camouflage Quiz! — Amazing Nature! 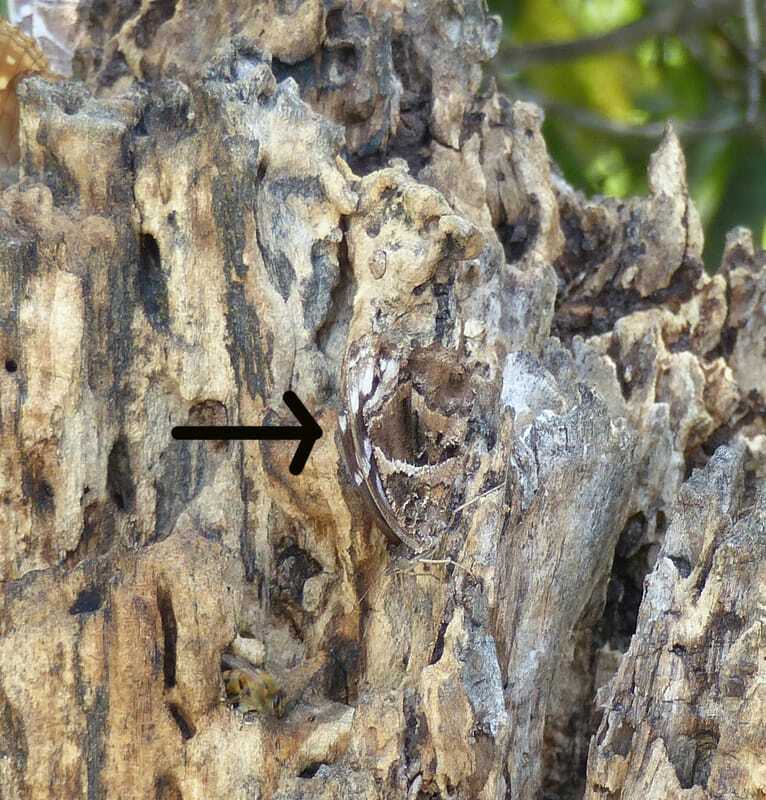 As you will see in the following photos, many insects are so well camouflaged they disappear into their environment. One of the fun things about taking photos of insects is that they are often such a challenge to find. You can be looking right at an insect and not see it and then, suddenly, there it is. To find insects, you have to be very patient (a quality I lack in spades) and look very slowly and carefully. 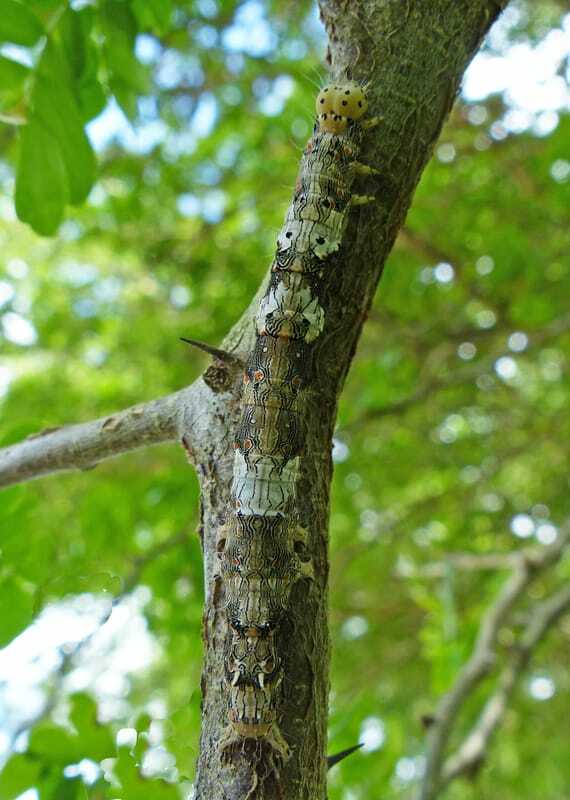 In many of the following photos illustrating camouflage, I first show you how the insect appeared camouflaged in its environment and then I zero in to show the insect in all its glory. 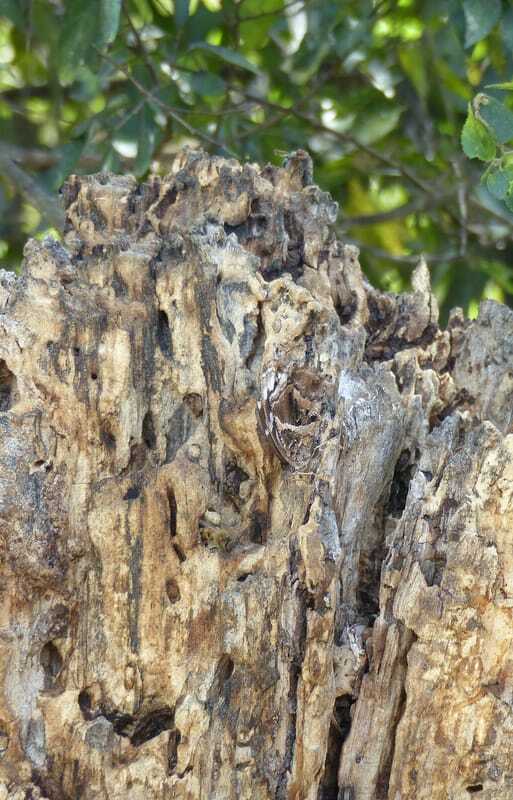 Try to see if you can find the insect before I show you what you are looking for. 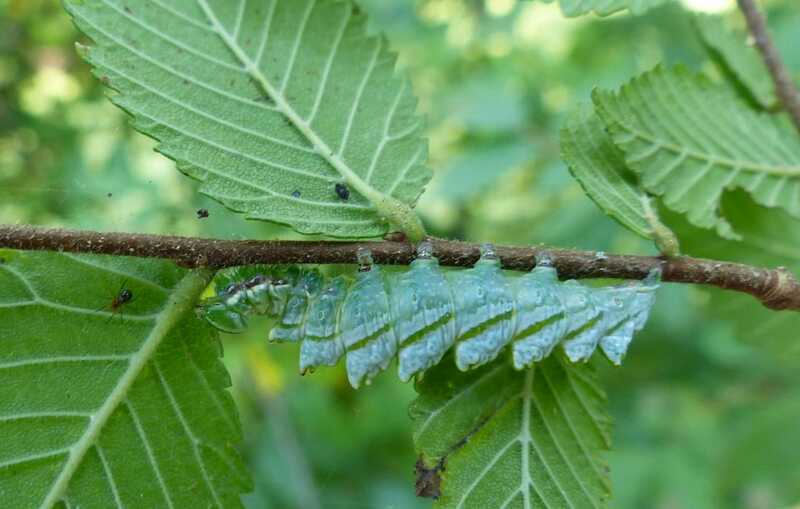 This is a close-up of a Double-toothed Prominent caterpillar (Nerice bidentata) succeeding in appearing as half a leaf. 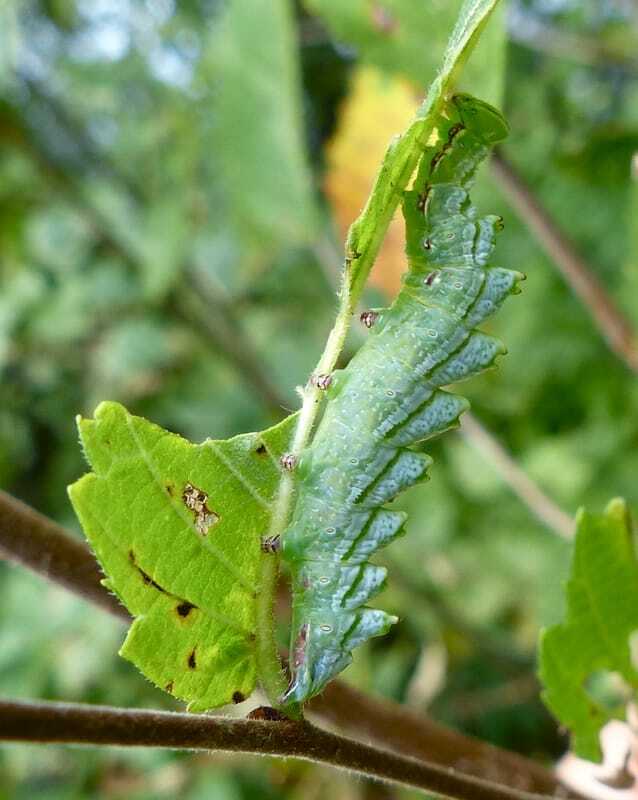 Typically, this caterpillar eats away part of a leaf and then situates itself where the leaf had been. I am still amazed that I found it. After I photographed it, I called my husband. Ron, over so he could videotape it. The problem was, I couldn’t find it. I knew I was looking right at it, but I couldn’t see it. After a frustrating search, I remembered that the photo I had just taken of it might give me a clue. I looked at my photo, saw a yellow leaf, found that leaf, and voila – there was my caterpillar! 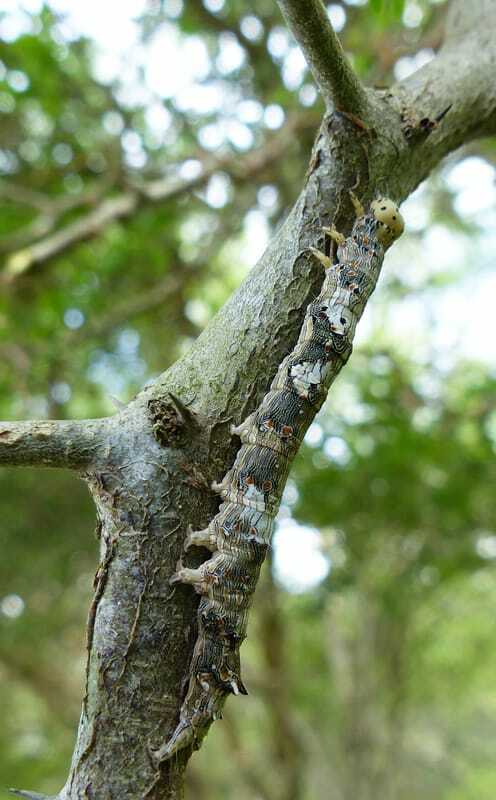 ​Hint: The caterpillar is pointed upwards. 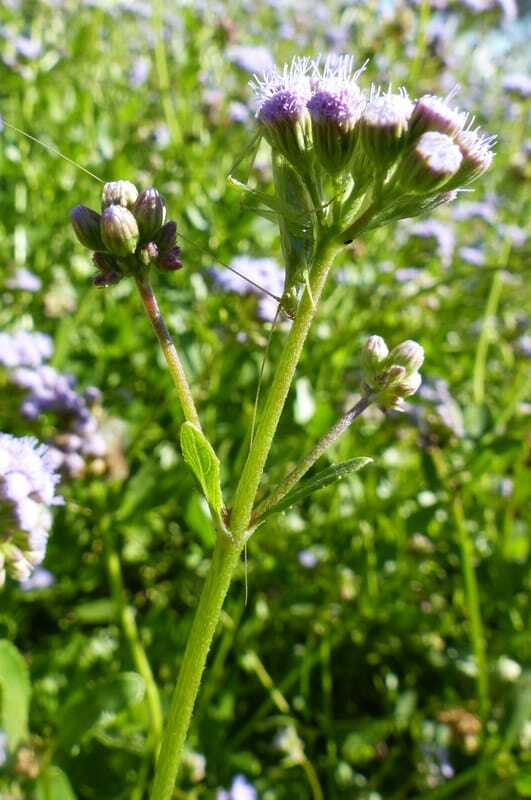 The head and legs grab the leaf vein at the top of the photo. Here is another Double-toothed Prominent looking like the edge of a leaf that I photographed the next year. Hint: The caterpillar is facing toward the left. 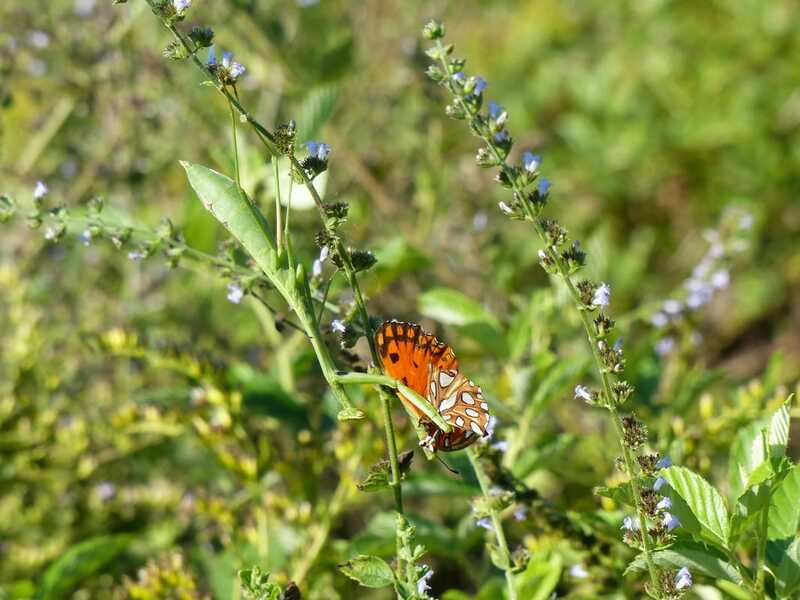 We were at Paynes Prairie (Gainesville, Florida), which is a great place to find insects (as well as bison, wild horses, and alligators), when I saw what I thought was a very strange butterfly in a bush. I approached the foliage to get a better look. 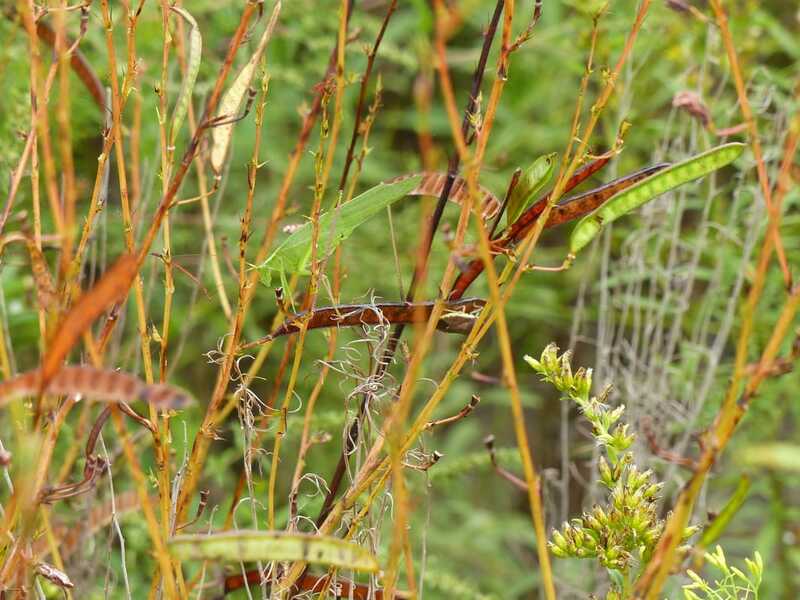 I determined I was seeing a Gulf Fritillary Butterfly without a head. I looked a little harder and the reason why popped into my view. 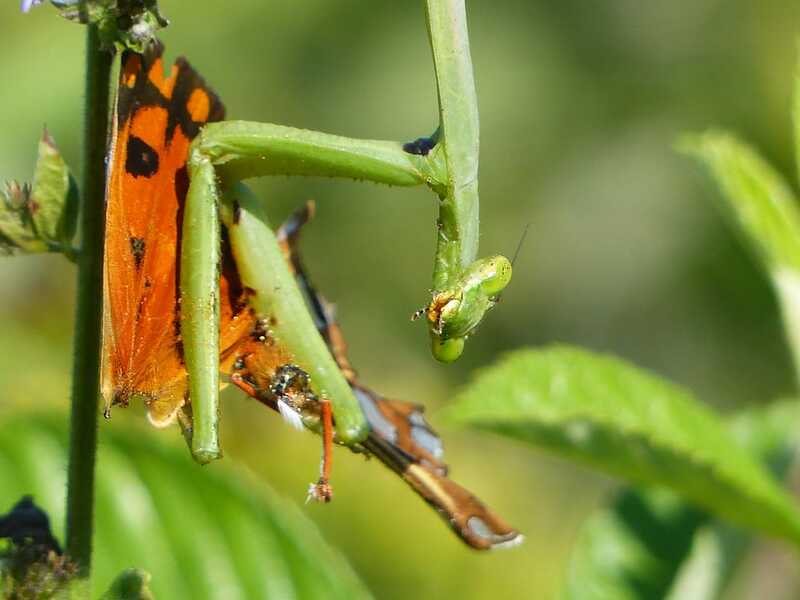 A mantis was eating the butterfly! 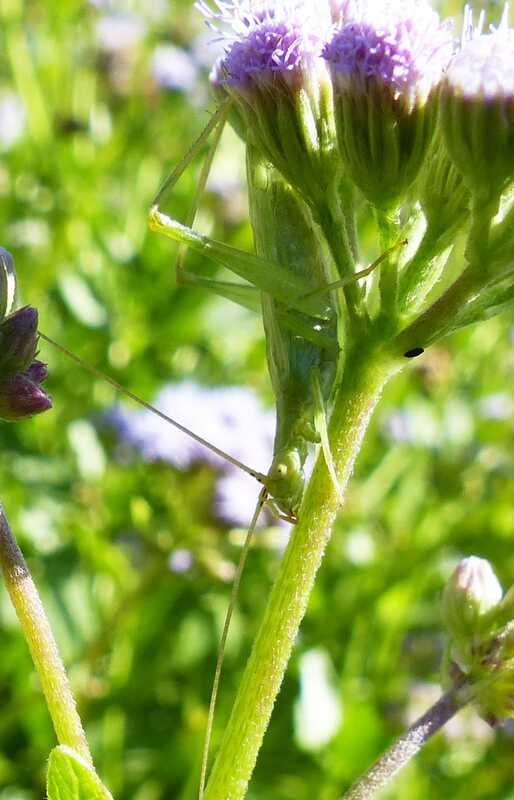 Mantids are great at camouflaging themselves, but primarily to catch food, not to hide from predators. Looking very much like part of a plant, they often stay very, very still while they wait for some unsuspecting insect to come close enough to grab with their large and powerful front legs. The Snowy Tree Cricket is doing a fine job of appearing to be part of the foliage. Can you find it? 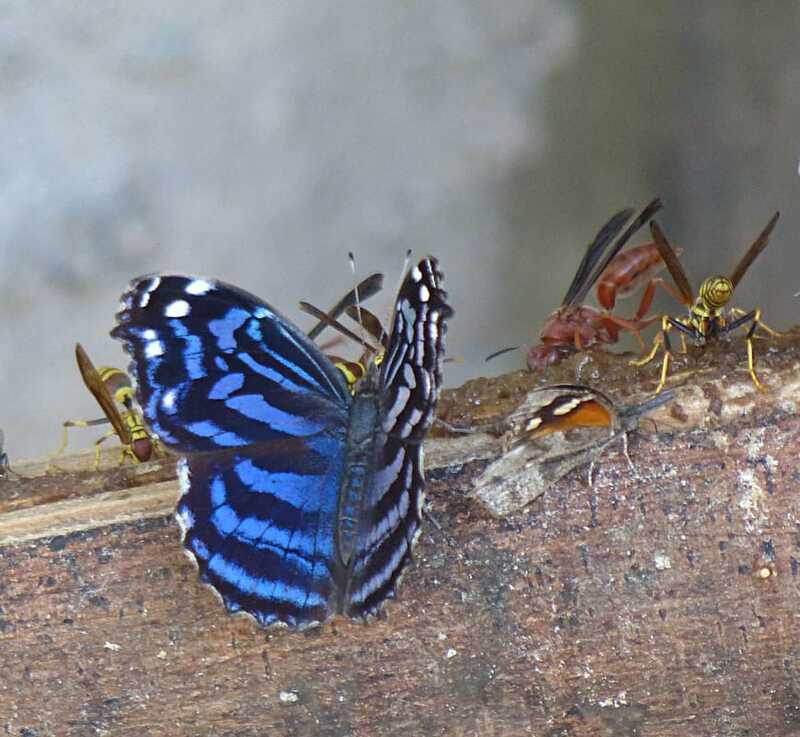 Mexican Bluewings are among the most beautiful of butterflies. Their range extends from Colombia through Central America to Mexico. In the United States, they are found only in the Rio Grande Valley in South Texas and when present, their camouflage often makes them extremely difficult to see. 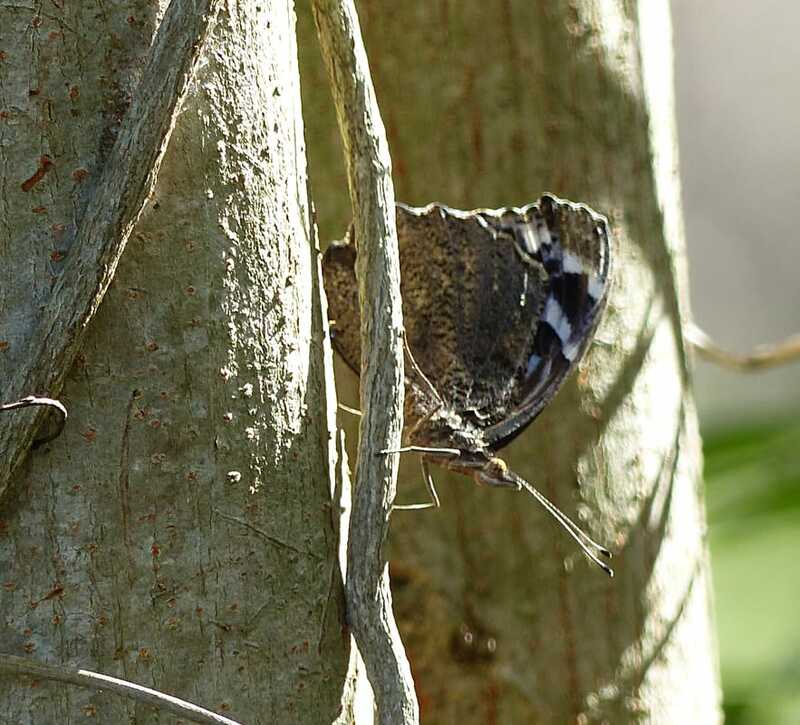 In the first photo, you see the Mexican Bluewing as we saw it (or almost didn't see it) at the National Butterfly Center in South Texas. See if you can find it. 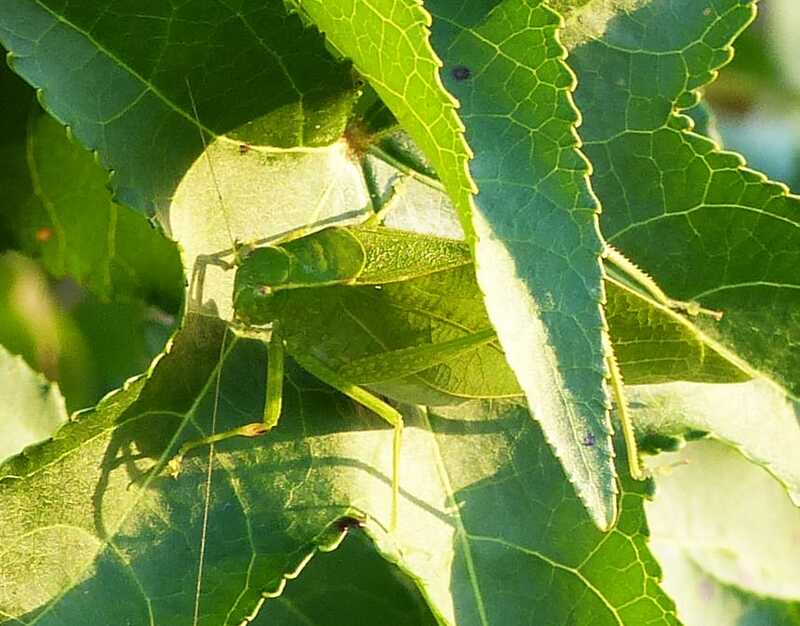 As you can see from the following photos, katydids are masters of camouflage. The color of their wings often matches perfectly the color of the leaf on which they perch. They often have markings that duplicate the imperfections of a leaf. The shape of their bodies often duplicates the shape of a leaf. They are not small insects, but blend into their environments so well, it is difficult to find them. I take every opportunity I can to find insects even if the place or time of year is not optimal. 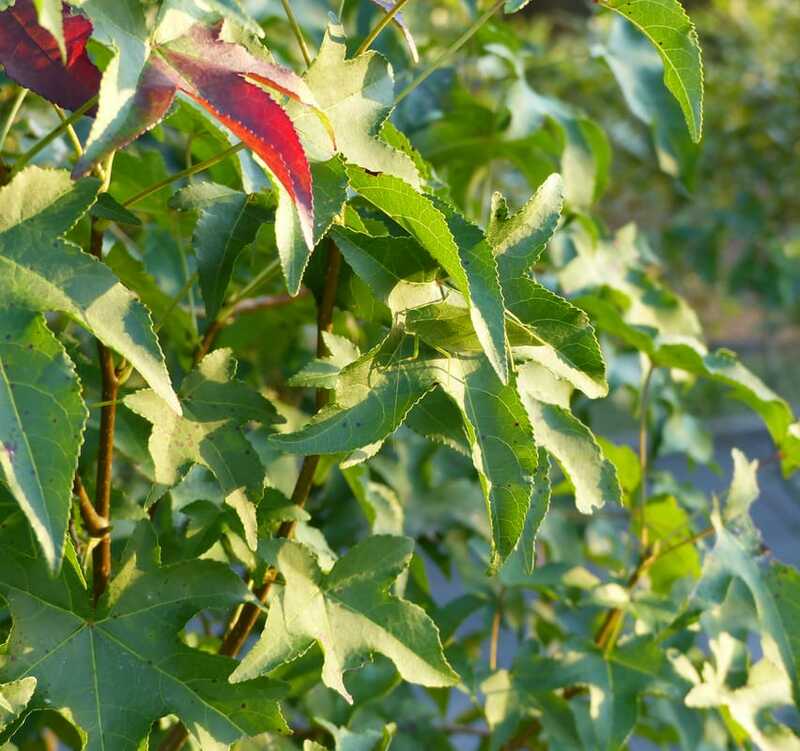 While staying at the Hilton Garden Inn in a suburb of Birmingham in the fall, Ron and I decided to search the plants at the edge of the grounds for insects. After looking very carefully, we found this katydid blending perfectly with the leaf it is on. Try to find it before you go on to the next photo. Is it a peapod?!! 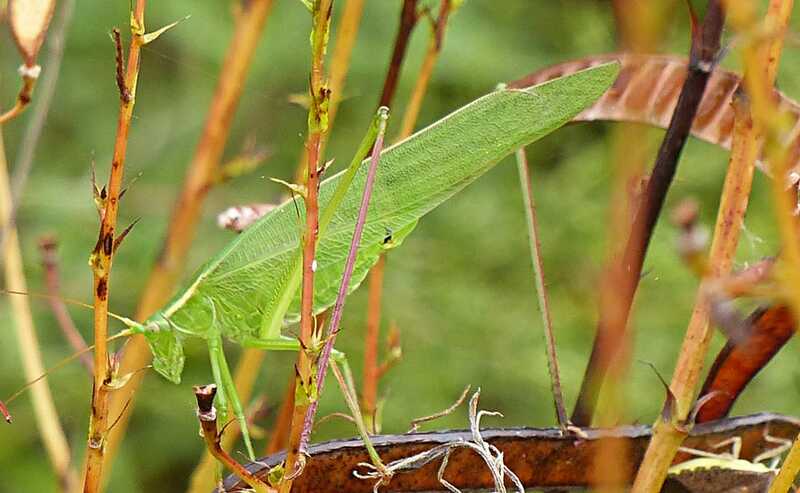 Not only is the coloration of this katydid close to that of the peapod, its stance is the same. Thin green and brown legs and wings make this kaydid almost impossible to see. 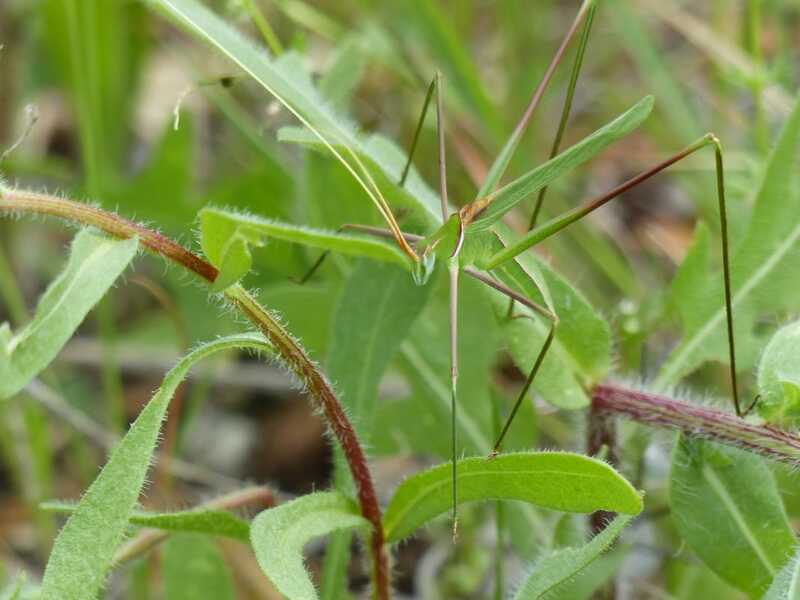 Find all of the 6 legs and you can find the katydid. I stared for a very long time at this creature before I decided that it was a living animal and not the texture of the bark of the tree. After seeing it through my binoculars, I was so glad I had investigated. (My credo: “When in doubt, check it out!”) What I had discovered was a large, 2-1/2 to 3-inch caterpillar, Metria endopolia. When I got too close with my camera, it started moving up the tree — so fast, I was only able to get a few shots. 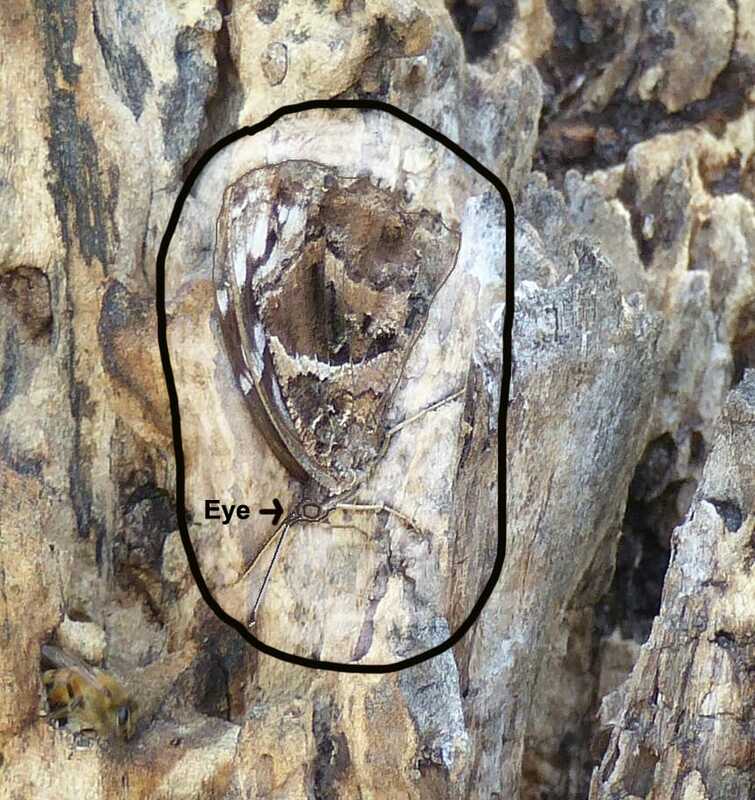 ​As you can see in the photo below, there is a large space between the 6 (three are shown) legs near the head of the Metria endopolia caterpillar and the prolegs below. Prolegs are not real legs but are used to propel the caterpillar or grab onto limbs or leaves. Because of the spacing of its prolegs, the Metria endopolia caterpillar cannot crawl, but must travel by looping its body between the prolegs and real legs. If you have ever seen an inchworm in motion, you can visualize how this caterpillar moves. What a thrill to see a Unicorn Mantis! 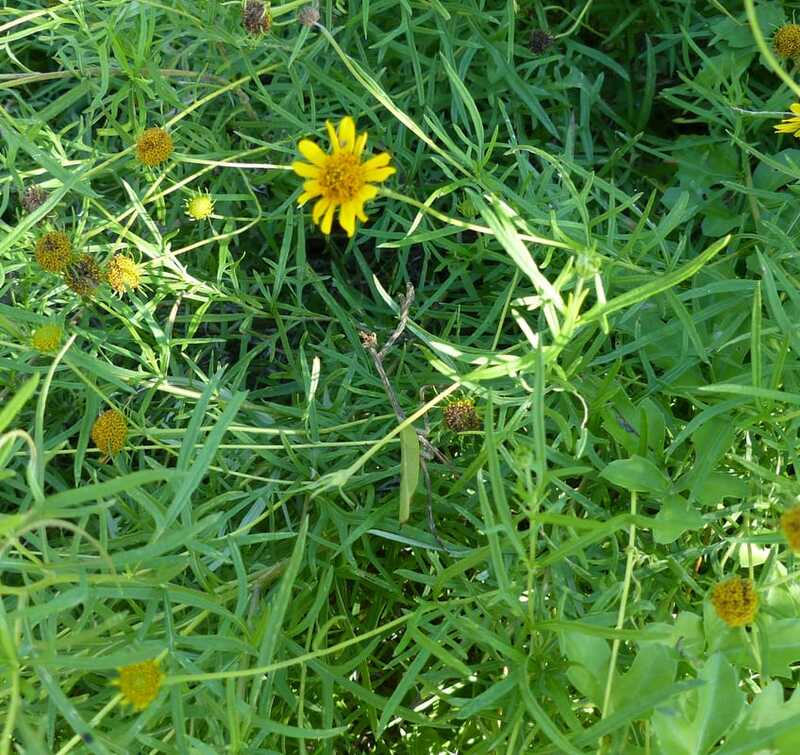 I thought I was just looking at a few yellow flowers and other foliage — and, there it was. Of course, it was doing a superb job of disappearing amongst the green plants. ​This close-up of the Texas Unicorn Mantis reveals why it blends into its environment so easily. Its wings look exactly like a leaf with veins and some discolored spots. 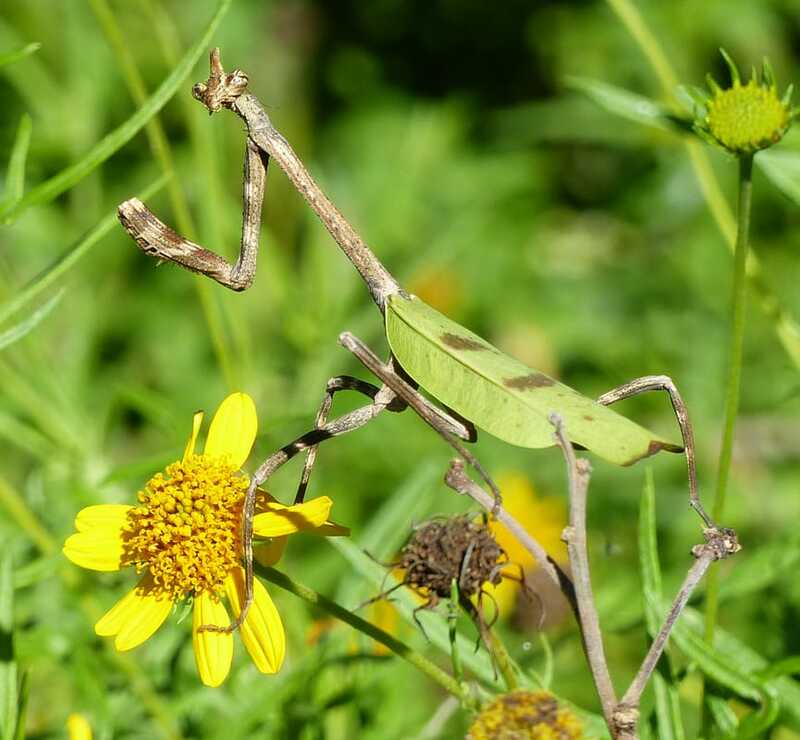 Its body, head, and legs look so much like a brown twig, it is hard to know where its legs end and the twigs it rests on begin. ​The unicorn mantis appears to have one horn on the top of its head like the mythical unicorn, but the horn-like projection is actually made of two parts that are not fused together. 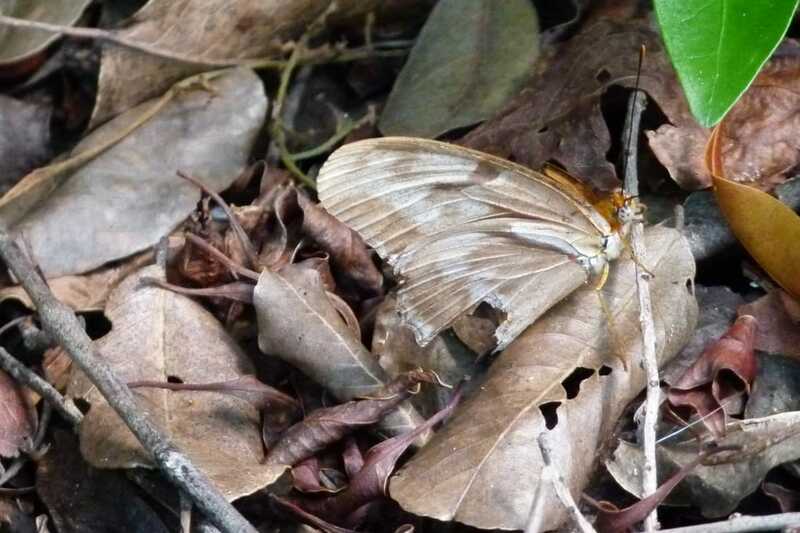 With its wings closed, the Julia butterfly can easily be mistaken for a dead leaf on the forest floor. But when it opens its wings, the Julia shows off its bright orange coloring. Even though easily seen when in flight, it is a very fast flyer and can often escape if a predator comes near. Its bright orange coloration serves as a warning that it may taste bad. 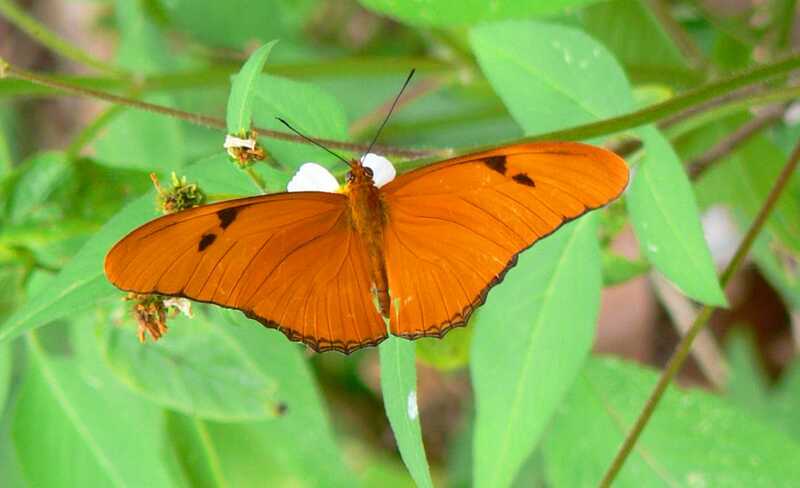 The Julia Butterfly opens its wings and we see its beautiful orange coloring.